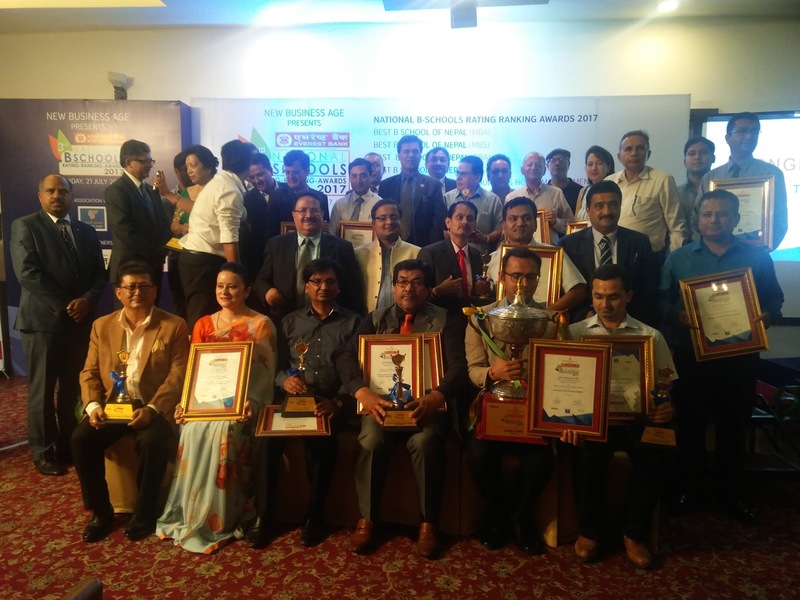 Out of 105 colleges offering Master of Business Studies (MBS) program with affiliation from Tribhuvan University, three colleges have been awarded as “Best B Schools of Nepal-MBS category” in the 3rd National B Schools Rating-Ranking Awards 2017 held in Hotel Annapurna, Durbarmarg, Kathmandu on 21 July. Goldengate International College has been awarded as the “Best MBS College”, whereas Nepal Padmakanya Multiple Campus became the first runner up. Kathmandu Model College (KMC) stood 2nd runner up among MBS Colleges of Nepal. Mr. Kishore Thapa former secretary of Government of Nepal, Mr. Chandra Dhakal Vice President of FNCCI and Mr. Bijay Bahadur Shah, President of Nepal Insurers Association provided Medal and award certificate to the winner.